LAKE ERIE, bordered by the province of Ontario in CANADA to the north, NEW YORK to the east, PENNSYLVANIA and OHIO to the south, and MICHIGAN to the west, is the shallowest of the Great Lakes at only 62 ft (18.9 m) and it remains the smallest in volume. Lake Erie is 241 mi wide (380 km), and 57 mi (91 km) from north to south and has 871 mi (1,401 km) of shoreline. Because of its shallowness, Lake Erie is the warmest of the Great Lakes in the summer, meaning it is the most biologically productive, and during the winter, it is the only lake out of the Great Lakes to freeze. Lake Erie is one of the five large freshwater lakes in North America. The other lakes surrounding Lake Erie are Lake SUPERIOR, Lake MICHIGAN, Lake HURON, and Lake ONTARIO. Eighty percent of the lake’s water flows in through the Detroit River, carrying water from lakes Superior, Huron, and Michigan. Lake Erie is the most heavily populated freshwater BASIN in the world. There are 17 metropolitan areas within the basin. Ecological problems have threatened this site more so than any other of the Great Lakes. Historically, this lake was used moderately by Native Americans for food and water. Later, when the Europeans arrived, they found a somewhat stable ecosystem that remained so mainly because of the Europeans’ interest in animal furs. However, that all changed when the large influx of immigrants arrived and began to utilize the land for agriculture and the water for fisheries. Industrialization and urbanization soon followed slowly lowering the quality of the water. Some of the many prominent problems was bacterial contamination, putrescence, and floating debris in the water. This undoubtedly led to diseases such as typhoid fever being contracted by people exposed to the water. In the 1950s, Lake Erie also was the first of the Great Lakes to display lake-wide eutrophic imbalance. Eutrophic imbalance refers to the imbalance of minerals and nutrients that promote proliferation of plant life in lakes and ponds. This was present because of the high levels of phosphorus output by factories in the very highly populated Lake Erie basin, and it had dire consequences on the lake’s ecosystem. Depleted oxygen levels were found along with excessive algal growth and the disappearance of entire families of fish. The 1960s brought growing public concern regarding the state of the lake’s water. Lake Erie was actually called the dead lake by the press. It evolved from a stable ecosystem to one very much affected by artificial fertilizers used by the surrounding farmers, waste from the surrounding communities, and factory waste. Floating waste, putrescence, and bacterial contamination were all of great concern to both the U.S. and Canadian governments. This concern brought much needed government measures to stabilize the lake’s ecosystem. Greater investment in pollution research by the U.S. and Canadian governments and efforts to regulate the toxicity and level of waste being released by the factories began in earnest. In 1987, the United States and Canadian governments signed the Great Lakes Water Quality Agreement (GLWQA) to develop a management plan for the Great Lakes. More specifically, under the GLWQA, they created the Lake Erie Lake-Wide Management Plan (LaMP), which included efforts from local, municipal, state and federal offices in the four surrounding states of Michigan, Pennsylvania, New York, and Ohio and the province of Ontario. The four subcommittees within the LaMP are; Beneficial Use Impairments, Sources and Loadings, Ecosystem Objectives, and Public Involvement. 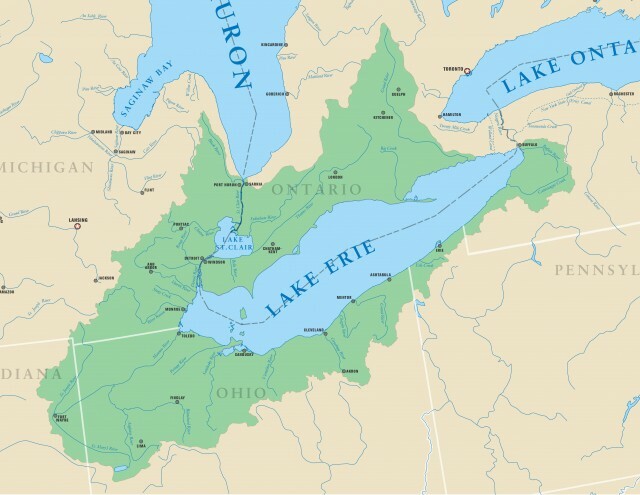 Thanks to the efforts made by both the American and Canadian governments, Lake Erie’s ecosystem has returned to a more stable state with lower phosphorus output levels, and it appears as if the eutrophic imbalance is being adequately dealt with by the governments as some species of fish have returned to the lake.